A type of body dismorphia that affects mostly flexible people. Flexorexia is the inability to see that you are flexible or are as flexible as someone else who you consider ‘Flexible’. Coming from an addictive background and a history with the eating disorder Anorexia and Bulimia, there is no question that if I want something I will go out of my way to achieve it. However, with most goals I set, there seems to be no feasible end. In the past, ‘Skinny’ was my goal. The truth is, ‘skinny’ has no limit and with no limit there is no stopping. This is how Anorexia came in to my life. Without a specific end point to achieve, when will you ever know you have made it? I would constantly compare my stomach, arms and legs to the girls around me and think that I was bigger than they all were when in reality I was 37kg and 2-4 sizes smaller than most of them. I just simply couldn’t achieve ‘Skinny’ and it became an obsession. Flexorexia is the SAME! I always wanted to become ‘flexible’, but how will I ever know when I’m ‘flexible’ enough? There seems to be no end to ‘flexible’. I look at my fellow pole friends like Maddie Sparkle, Sarah Jade, Bendy Kate, Marion Crampe and Anastasia Skukhtorova (to name just a few) and think, I wish I was as flexible as they are. Constant media updates of their photos and videos makes me feel inflexible in comparison. You may think I sound CRAZY, but it’s the dismorphia that I have which makes me unable to see my flexibility as being ‘flexible’. No matter how flexible I get, there is always MORE flexibility to be gained! I think what makes me feel like I am not flexible enough is the fact that 80% of the time, my body is aching and feels horribly sore. I also don’t train my back bending everyday sometimes not even for a couple weeks. 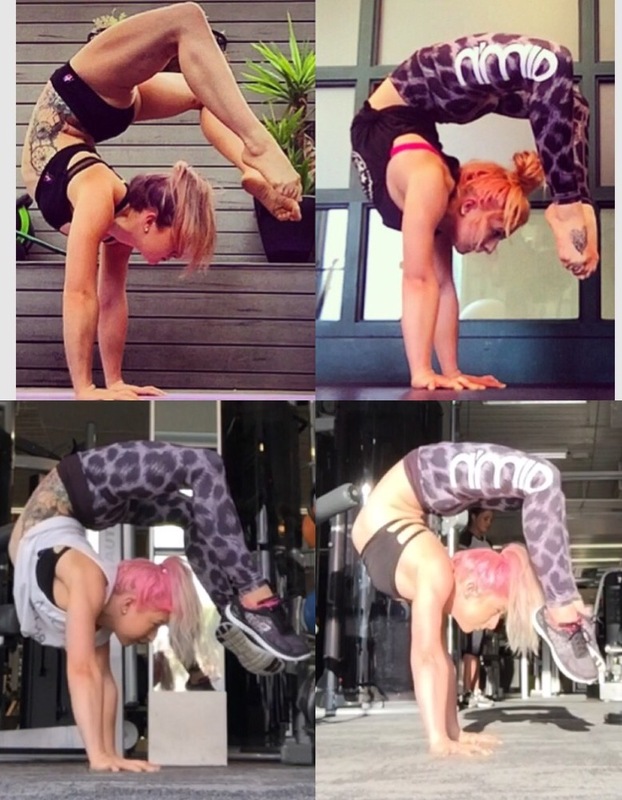 The truth is, I was not always this flexible and for me to backbend takes a lot of warming up, training and recovery. I don’t just spring out of bed and land in a bridge and then go to brush my teeth with my leg behind my head like some of you may think, I train contortion now on the odd occasion, do maintenance stretching after a 30 min run mostly everyday, and leave the crazy stuff for on stage when adrenaline can help me out! I have now come to the conclusion that no matter what other people are doing, you need to do what’s good for you! Don’t compare yourself to what other peoples body’s can do because everyone is shaped and built differently and will bend and move in different ways. Aspire to be the best YOU and make obtainable milestones to always gain a sense of achievement! It is also a great way to monitor your progress! Never forget from where you started from because facinating over the end can ruin the journey in between. In conclusion, I just wanted to make clear that no matter how flexible you are, skinny you are, beautiful you are there will always be many other flexy, skinny, beautiful people in the world. However, they won’t be YOU, and YOU is what makes YOU special. LOVE WHAT YOU DO AND OWN IT, BECAUSE ONLY YOU CAN BE YOU! Thank you for this post…. I will be sharing this. So glad to see a new post! The flexy-progress that you made is absolutely amazing and inspiring. I love this! Nobody is YOU! Great message! The Need for Knee Pads!